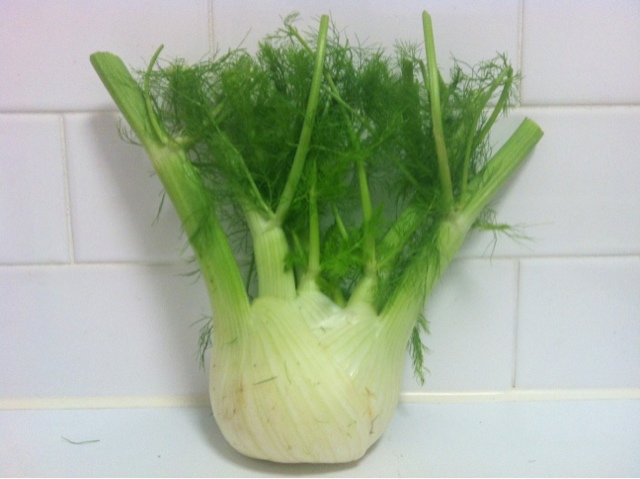 So, it's only in recent history that I've discovered how much I like fennel. The first time I cooked it was an absolute disaster. To this day I still have no idea if it was hideously undercooked or a bad specimen. 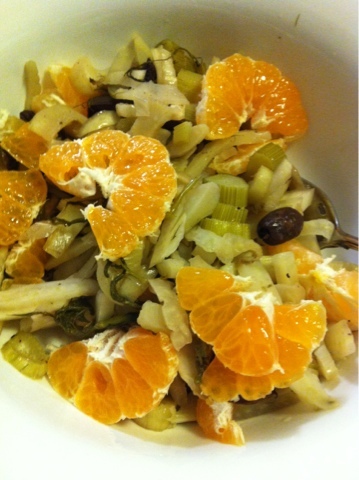 I had had such delicious fennel dishes (or usually as a side salad, often with orange) that I persisted with trial and error. I now know it is delicious both raw (snap off some of the smaller inner pieces as a pretty and delicious fingerfood addition to an antipasto plate; or shave/slice thinly and dress for a fast and delicious salad) or roasted. You can eat all the parts - the fluffy leafies can be used as a very similar replacement for dill; the stalks and bulbs are crunchalicious and the seeds are (as Simon on The Cook and The Chef reminds us) the cause of the distinctive Italian pork and fennel sausages. Line a large roasting pan with baking paper; and spray some olive oil on. Preheat oven. Wash two large fennel bulbs (usually sold with about 3 inches of stalks and leaves poking out in a very mohawky style). Tear off the fluffy leaves and place into the roasting pan. Slice off the stalks from the bulb, slice off and discard top dried out portion, then slice stalks thinly and chuck into roasting pan. Cut the bulbs in half and slice very thinly. Try not to nibble on ALL the inner "petals" as chef's privileges whilst doing so, I challenge you! Place slices into roasting pan. Drain (and -optional- cut in half) a small jar (or half a large jar) of pitted kalamata olives. Mix fennel, a splash or spray of olive oil and a splash of white wine (or if you're detoxing water will do). Cut a whole dwarf meyer lemon (or if you don't grow these on your balcony, half a regular lemon) in half lengthways, squeeze juice over contents of roasting pan then very very exquisitely (but don't cut yourself - lemon juice! ouchie!) thinly slice the lemon rind/flesh and put into the roasting pan on top (so people can opt to pick it off if they can't hack it). Basically I tailor this to whatever else is in the oven. For al dente - if you want a quick cook go for 200° and 30-45 minutes (consider adding aluminium foil cover to prevent burning; if doing a roast or bake at 180° at the same time it will take you 45-75 minutes; slow roasting meat as well at 160°, will take approx 90 minutes - just keep checking back and taste for consistency, and mix occasionally to avoid too many top burnt bits. Serve as a side dish or a large salad. Goes particularly well with the roast chicken a la Mediterranean that I have previously described. To be honest, I hadn't blogged sooner about this mainstay of my vegie repertoire because it all seemed too simple. However, the simple things in life are often the most delicious. The other day I had heaps of this dish leftover, and a huge bag of Imperial mandarins - all good things to take advantage of in winter - and I had an epiphany - reheat this dish and top with thin (half a centimetre) slices of mandarin and hey presto - heaven is a place on earth in winter! Enjoy!